A specialized library and archive, with books and documentation on contemporary art in the micro geo-cultural areas and small states of Europe. On Saturday, January 29, 2011, has been opened the Library Archive of Little Constellation with the participation of the Capitano di Castello (Mayor) of Serravalle, the Ambassador to the OSCE and a large audience of young people interested in culture and contemporary art. Alessandro Castiglioni, curator and art historian, and Rita Canarezza & Pier Paolo Coro presented the characteristics of this first research center and specialist archive, freely available for consultation, which comprises some 415 volumes, including a number of rare books and publications on contemporary art, which were collected in seven years’ work in Europe, and particularly in the small European states: Andorra, Cyprus, Iceland, Liechtenstein, Luxembourg, Malta, Monaco, Montenegro, San Marino, and in a few european geocultural micro-areas including Canton Ticino (CH), Ceuta (E), Gibraltar (UK), Kaliningrad (RU). The occasion was marked by presentations and artistic interventions. 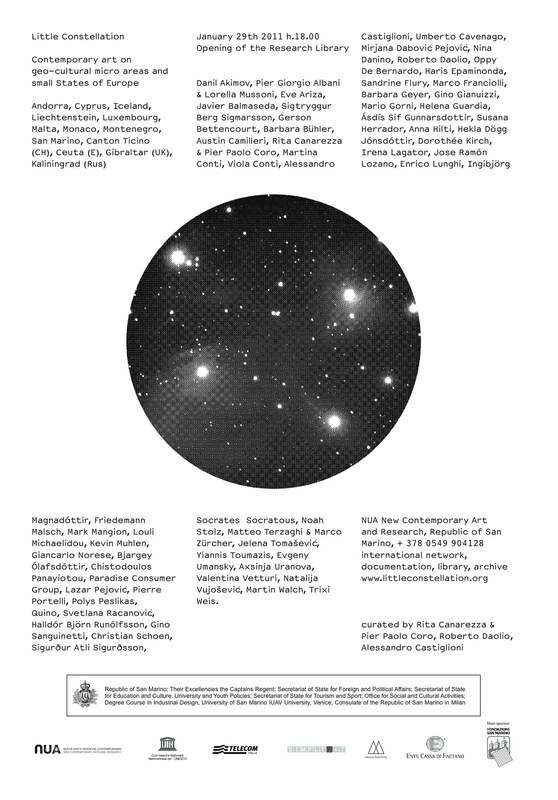 Little Constellation, by means of a constant work on international art, now restores a social space for culture and research to the territory of San Marino. All this has been possible thanks to the interest and support of private and public organizations, which have invested in an innovative art project, which is now part of the common heritage. Artists and curators archive library collection: Danil Akimov, Pier Giorgio Albani & Lorella Mussoni, Eve Ariza, Sigurður Atli Sigurðsson, Javier Balmaseda, Sigtryggur Berg Sigmarsson, Gerson Bettencourt, Barbara Bühler, Austin Camilleri, Rita Canarezza & Pier Paolo Coro, Martina Conti, Viola Conti, Alessandro Castiglioni, Umberto Cavenago, Mirjana Dabovic’ Pejovic’, Nina Danino, Roberto Daolio, Oppy De Bernardo, Eleanor Duffin, Haris Epaminonda, Sandrine Flury, Marco Franciolli, Barbara Geyer, Gino Gianuizzi, Mario Gorni, Helena Guardia, Ásdís Sif Gunnarsdottir, Susana Herrador, Anna Hilti, Hekla Dögg Jónsdóttir, Dorothée Kirch, Irena Lagator, Jose Ramón Lozano, Enrico Lunghi, Ingibjörg Magnadóttir, Friedemann Malsch, Mark Mangion, Louli Michaelidou, Kevin Muhlen, Thomas Negrevergne, Giancarlo Norese, Bjargey Ólafsdóttir, Chistodoulos Panayiotou, Paradise Consumer Group, Lazar Pejovic’, Pierre Portelli, Polys Peslikas, Quino, Svetlana Racanovic’, Agnès Roux, Halldór Björn Runólfsson, Gino Sanguinetti, Christian Schoen, Socrates Socratous, Noah Stolz, Teatrutramm, Matteo Terzaghi & Marco Zürcher, Jelena Tomaševic’, Yiannis Toumazis, Evgeny Umansky, Axsinja Uranova, Valentina Vetturi, Natalija Vujoševic’, Martin Walch, Trixi Weis. A project by NUA new contemporary arts and research; project partners: Social and Cultural Activities Office; Fondazione San Marino (main sponsor); Ente Cassa of Faetano. Cultural partners: MUDAM Musée d’Art Moderne Grand-Duc Jean, Luxembourg; Casino Luxembourg – forum d’art contemporain, Luxembourg; CIA.IS Centre for Icelandic Arts; National Gallery of Iceland; Living Art Museum, Iceland; Cultural Services Cyprus; The Nicosia Municipal Arts Centre, Cyprus; Malta Council for Culture and the Arts; MCA Malta Contemporary Art Foundation, Malta; Ateljer Dado, National Museum of Montenegro, Cetinje; Montenegrin National Theater; Centre for Contemporary Art, Podgorica, Montenegro; Serveis Culturals Andorra; Escola d’Art la Llacuna, Andorra La Vella, Andorra; Museo Cantonale d’Arte, Lugano; La Rada, Locarno, Canton Ticino / CH; Dirección Provincial de Educacion; Instituto De Bachillerato Siete Colinas, Ceuta / E; Ministry of Culture, Heritage, Sport & Leisure, Gibraltar; Fine Arts Association Gallery, Gibraltar / UK; Kaliningrad Branch of The National Centre for Contemporary Arts; Ministry of Culture of the Kaliningrad Region; Department of the Kaliningrad Regional Government, Kaliningrad / RU; Kulturstiftung Liechtenstein; BBKL Liechtenstein; Kunstmuseum Liechtenstein; Neon Gallery, Bologna /I.